That was just one of the many questions from a group of Year 9 pupils from across Greater Manchester who came to a STEM careers event organised and hosted by BBC Outreach. It was a great chance for 50 13-14 year olds looking at their GCSE options to take a closer look at the careers and pathways that science, technology, engineering and maths could lead to. 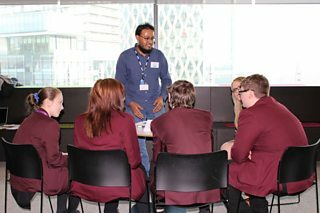 BBC Outreach recruited 12 volunteer STEM ambassadors from across BBC North who were able to step away from their jobs for the day to give practical demonstrations on their roles and advice on which GCSE subjects would be the most useful. They represented a range of departments including the BBC Homepage team, CBeebies, BBC News studio operations, Research and Development, BBC iPlayer, Knowledge and Learning, mobile core engineering, and BBC Radio 5 live weather. 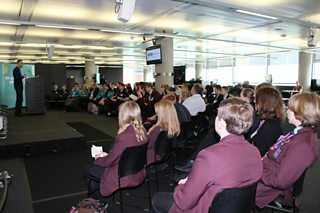 The young people from 12 different schools came to the event at Quay House in MediaCityUK fully prepared with vital career questions for their ambassadors. The Ambassadors were on hand to answer those questions and give the young people a chance to explore their work, from checking out Radio playlists to looking at how BBC iPlayer is embedded into other services like Sky TV or Virgin TV - and more popularly with the students - on PS4s and XBOXs. 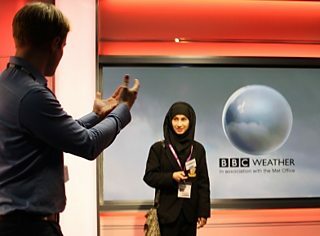 After busy sessions meeting all the ambassadors, the teenagers were given a rare opportunity to join BBC Radio 5 live’s weather forecaster Simon King in the BBC Breakfast studios for a session on how to do an on-screen forecast. This proved to be a big hit with the students who took the opportunity to forecast some much needed sunshine over the skies of Manchester. The pupils and their teachers all had lots of praise for the initiative - especially the timing of the event as Year 9 students are currently finalising their GCSE options. It was an amazing day. 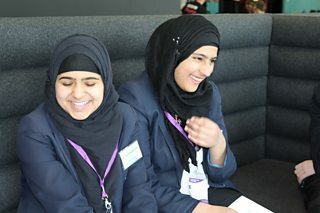 It was as exciting for the Outreach team and the STEM ambassadors as it was for all the young people who joined us. *BBC Outreach & Corporate Responsibility brings the BBC closer to its audiences - particularly those audiences we have identified as harder to reach - with face-to-face activity, community support and staff volunteering.